I know some guys still have reservations about using magic to pickup women so I grilled with a couple questions addressing these issues. 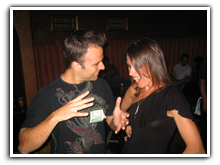 learning magic and how you learned to apply it to picking up women? tricks. It was like a drug. using magic to pickup women as being corny and childish (i.e. Kezia of PUATraining). pull it out and when to keep it tucked away. interaction with a girl, you will cause a spontaneous moment of wonder. You wouldn’t believe how that can flip a girls switch right around. But basically, even a girl like Kezia would have fun with magic when done correctly. When’s the last time any woman was 100% correct about what even herself responds to? Mystery and Criss Angel dress flashy while in every video of yours you seem to dress more conservative and normal. Is there a reason why you dress the way you do? story in where you used magic to attract her? at a bar. I was with my friend Andrew, she was with a girlfriend of hers. psychically. She still doesn’t know how I did THAT one. releasing version 2.0 of it now. What does it all consist of? bar or a club…thus looking unnatural. them down, step by step and even including the exact dialogue you can use. fun as hell…then the PUMA Skills Mastery Course was made for you. decided to reveal everything I know. incredible bonuses from myself and some of the top names in pick up. You can now get PUMA Skills 2.0!